Ubisoft's upcoming platformer Rayman Legends offers players a history lesson in the form of 40 levels lifted from its direct predecessor Rayman Origins. Rayman Legends is the latest entry in the Rayman series and arguably one of the franchise's most important iterations. Though the Rayman character has never been as popular as other mascots like Mario or Sonic, he's recently had something of a resurgence owing primarily the gorgeous, meticulously crafted Rayman Origins. Not wanting players to forget about that title seems a key concern for Ubisoft, so the developers of Rayman Legends are including a substantial reference to the older title in their game. Specifically, 40 stages from Origins will be reworked for inclusion in Legends. These levels, which Rayman creator Michel Ancel describes as being available to players from the start of Legends, will be largely similar to their source material, but each stage has been aesthetically improved to suit the newer game's more advanced graphics engine. Further, Ancel also reveals that Legends will include a soccer-style minigame dubbed "Kung Foot," which casts players as various members of the Rayman cast and asks them to use the game's assortment of maneuvers to kick, punch and gradually nudge a ball into the opposing team's goal. It's not a huge addition, but Kung Foot has apparently been one of the go-to games played by the developers working on Legends in their spare time, so it should offer some entertainment value, if only to drunk groups of friends gathered together with little else to do. 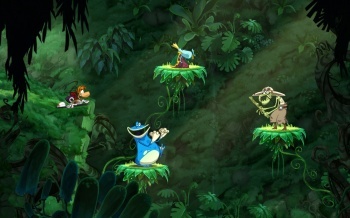 Rayman Legends debuts on the Xbox 360, PlayStation 3, Wii U and Vita handheld on September 3.